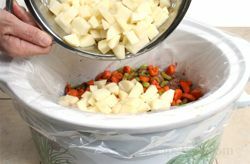 When cooking slow cooker soup and stew recipes, the flavors of all the ingredients have an opportunity to blend together and create a great taste. 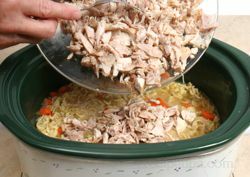 Many traditional soup and stew recipes can be adapted to slow cooker recipes by adjusting the cooking time. 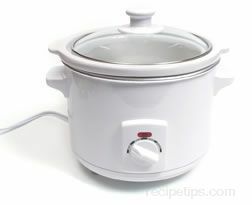 The use of a slow cooker is a convenient method of cooking soups and stews. 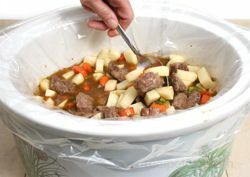 Most slow cooker soup and stew recipes have all the ingredients placed in the slow cooker and are cooked together for several hours. 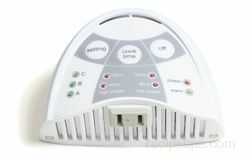 There are some slow cooker recipes that call for an ingredient, such as pasta, to be added at the end of the cooking time so that it does not become overcooked during the slow cooking process. 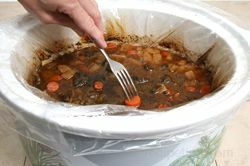 Most slow cooker soups and stews can be prepared the day before, if desired; and then you can start the soup or stew in the slow cooker before you leave for the day, and when you return at the end of the day, it will be ready to eat. 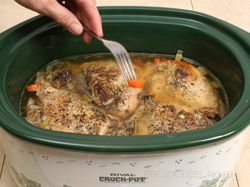 Because a slow cooker uses low cooking temperatures, it is safe to leave the slow cooker unattended and if the food cooks a little longer than the suggested cooking time, it generally does not overcook. Prepare the vegetables by washing the celery and peeling the carrots. Then cut them into slices, keeping them consistent in size. 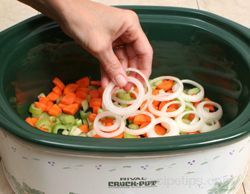 Place the carrots and celery in the bottom of a 5 quart slow cooker. 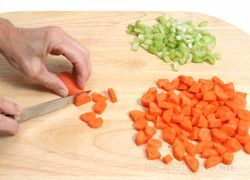 Cut the onion into slices and lay them on top of the carrots and celery. If a whole chicken was purchased, cut it up into pieces. 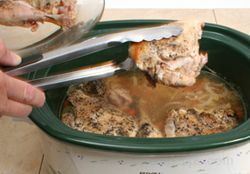 For information on how to cut up a whole chicken, see RecipeTips.com - Cutting Up Chicken. 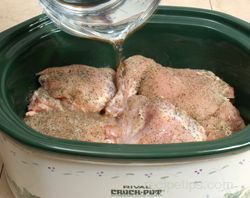 Clean the chicken and remove the skin and excess fat. Place the pieces of chicken on top of the vegetables. 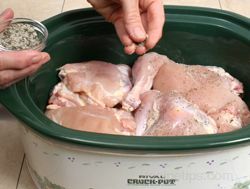 Sprinkle the salt, pepper and basil over all of the chicken. Pour the water over all the ingredients in the slow cooker. 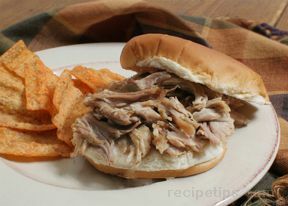 Cover and turn the slow cooker on high and cook for an hour. After an hour turn the cooker down to low and cook for an additional 6 to 8 hours. Or, cook on low for 8 to 10 hours. Check for doneness after 8 to 10 hours. 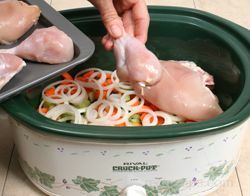 Vegetables should be tender when poked with a fork and the chicken should be done. 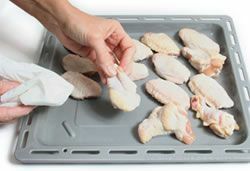 Check chicken doneness with an instant read thermometer. Internal temperature should be 180°F for the dark meat and 175°F for the white meat. Or, if pierced with a fork the juices should run clear. 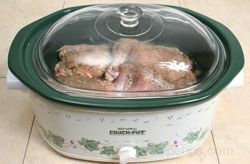 If chicken is done, carefully remove it from the slow cooker so it does not come off the bones. Add the uncooked noodles to the slow cooker with the vegetables and broth. Cover and cook an additional 15 minutes on high. 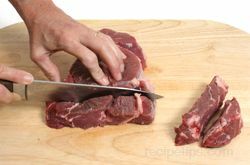 While the noodles are cooking, remove the meat from the bones and cut into bite size pieces. When the noodles are done, add the chicken pieces back in the slow cooker. This is a fairly dense soup, so if more liquid is preferred, just add some hot broth to the slow cooker. Cover and cook until meat is thoroughly heated and then serve. Note: Watch the doneness of the noodles carefully. It is best to cook them a little underdone because after adding the meat back in, the noodles will continue to cook as the chicken is being reheated. If the noodles get overcooked they will become mushy and fall apart in the soup. The noodles could also be boiled in the traditional manner on the stovetop and then added to the soup along with the chicken after it has been removed from the bones. 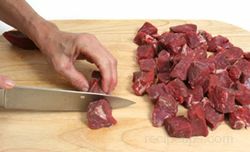 Trim off the excess fat and any gristle from the meat. 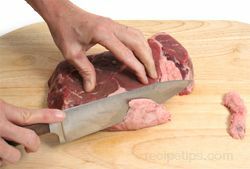 After trimming fat, cut the meat into 1 inch strips. Be sure to cut across the grain for more tender meat. Cut the strips crosswise into one inch cubed pieces. 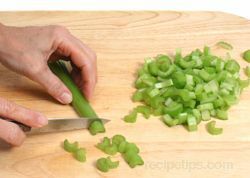 Clean the celery and cut into pieces. Peel the carrots and cut into slices. 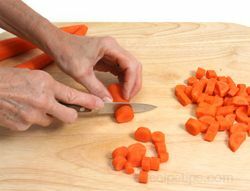 Be sure to cut the celery and carrots into consistent size pieces. Set them aside to be added later. 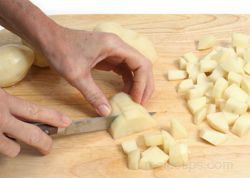 Peel the potatoes and cut into bite size pieces. Place in cold water while waiting to use to keep them from turning brown. Place the flour on a plate and season the flour with salt and pepper. 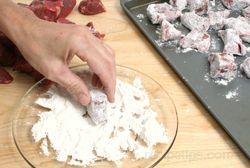 Dredge the meat in the flour to lightly coat. 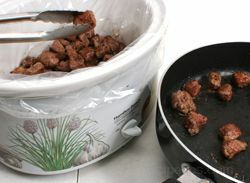 Before beginning to brown the meat, place a slow cooker liner in the crock of a 5 or 6 quart slow cooker. 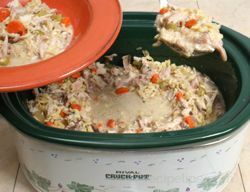 Open the liner and place it in the crock. 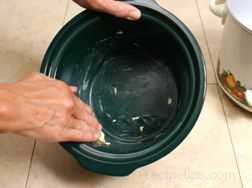 Fit the liner to the crock by pressing it on the bottom and to the side walls so it fits snug inside the crock. 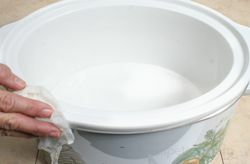 The top of the liner should be pulled over the edge of the crock. 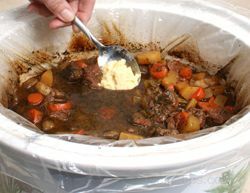 Note: It is not necessary to use a liner but it will make clean up much easier when the stew is done. Heat 2 tbsp. of butter and 1 tbsp. of oil in a skillet. 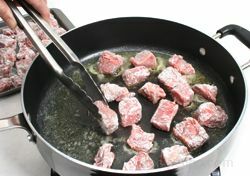 When it begins to sizzle, add some of the stewing meat to begin browning. Do not overcrowd the meat in the skillet. Brown the meat in several batches. When meat has been browned on all sides, transfer to the slow cooker. 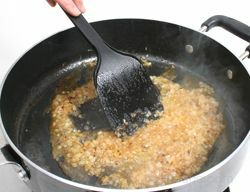 After the meat has all been browned, add the remaining butter and oil to the skillet and once it begins sizzling again, add the onions and brown slightly. 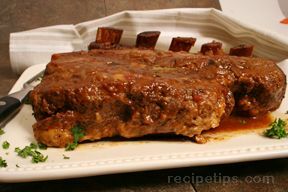 When they are browned, add them to the slow cooker on top of the meat. 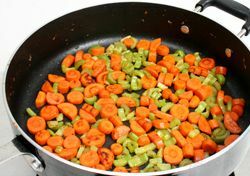 Add the celery and carrots to the skillet and cook until lightly browned. Add the browned vegetables to the slow cooker. 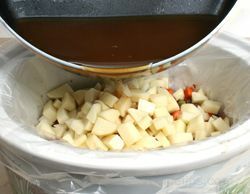 Drain the water off the potatoes and add them to the slow cooker. 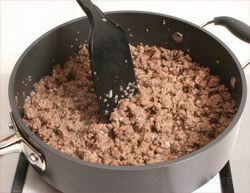 Add any remaining flour from dredging the cubed meat to the juices in the skillet and whisk them until well mixed. 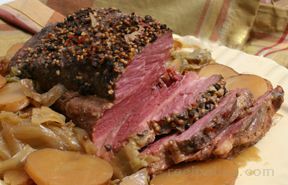 Gradually add the beef broth to the skillet and scrape sides and bottom to loosen flavorful bits. Add the Worcestershire sauce to the pan and heat the mixture to a simmer. Pour simmering broth over all the ingredients in the slow cooker. Stir all the ingredients in the broth to mix the meat and vegetables evenly. 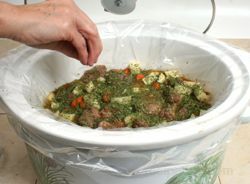 Sprinkle the parsley flakes into the slow cooker and cover. Cook on high for 1 hour and then turn down to low and cook for an additional 5 to 6 hours. Or, cook on low for 7 to 8 hours. At the end of the cooking time, check for doneness. The vegetables should be tender when poked with a fork. 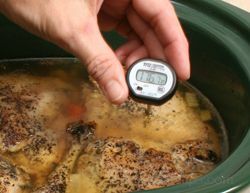 Check the internal temperature of the meat with an instant read thermometer. It should be a minimum of 145°F. 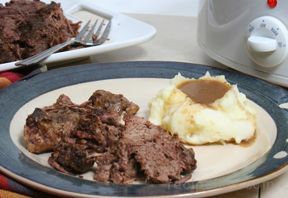 If the gravy is not thick enough when the stew is done, it can be thicken by adding small amounts of a flour paste that consist of equal amounts of flour and butter. 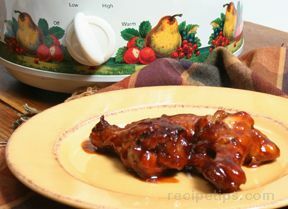 Stir in small amounts until gravy is the desire thickness and then simmer for 5 or 10 minutes. Taste stew when done to see if more seasoning is required. Add salt and pepper accordingly. 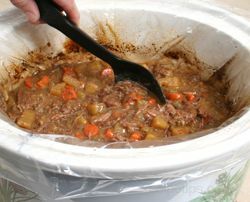 When the stew is done, serve it from the slow cooker or pour it into a large serving bowl and serve while warm. 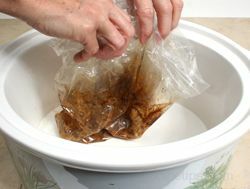 Allow the slow cooker to cool and then remove slow cooker liner and discard. 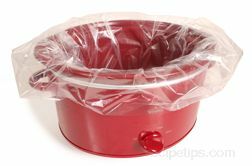 Wipe any spills from the slow cooker that may have occurred and then the slow cooker should be ready for storage. 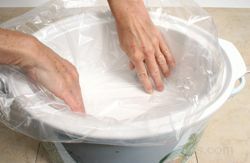 The liners make for an easy clean up. Some recipes will call for the vegetables to be sautéed before adding to the slow cooker to begin the cooking process and for added flavor and color in some soups and stews. If the recipe calls for milk or cream, it should be added at the end of the cooking time to prevent it from curdling as the result of too long of a heating period. 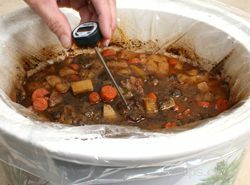 Be sure there is at least 3/4 to 1 inch of space between the soup and the top edge for the crock in slow cooker. If the soup or stew has an accumulation of fat on the surface when it is finished cooking, use a spoon to skim the fat off before serving. Small amounts of fat can be removed by placing a paper towel on the surface of the soup or stew. When lifted off the grease has been soaked up in the towel and removed. 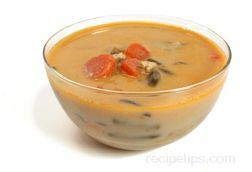 There are several methods that can be used to thicken soups and stews when necessary. 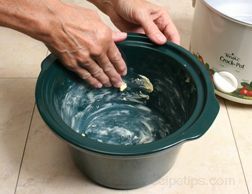 Flour: Mix equal amounts of butter and flour. Whisk in a little at a time into the soup or stew at the end of the cooking time. It should thicken in a short time, but cook for at least 5 minutes to eliminate the raw flavor. 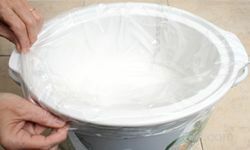 Cornstarch: Add to cold water to form a smooth, thin paste. Whisk in a little at a time into the soup or stew at the end of the cooking time. The boiling water should thicken quickly but cook for 10 minutes to eliminate the raw flavor. 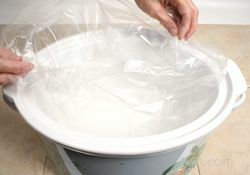 Arrowroot: Add to cold water to form a smooth, thin paste. 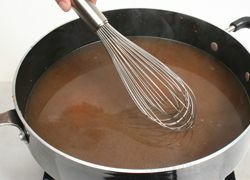 Whisk in a little at a time into the soup or stew at the end of the cooking time. Arrowroot will thicken as it reaches the boiling point but it can thin out if cooked too long so it is best to add it at the end of the cooking process. 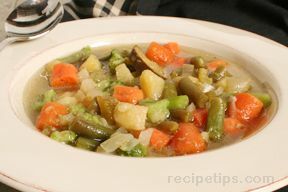 Reduction: Remove the meat and vegetables from the soup or stew using a slotted spoon. Pour the liquid into a large skillet and bring to a boil. 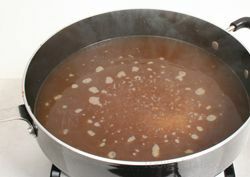 Boil until it is reduced to the desired consistency. Add back into the slow cooker and replace the meat and vegetables. Cook on high until all ingredients are heated thoroughly. 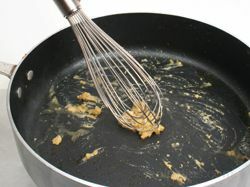 Beaten Eggs: Sometimes used to thicken smooth soups. Allow the soup to cool slightly before adding the beaten eggs. Whisk continually as the eggs are being added to prevent them from curdling. 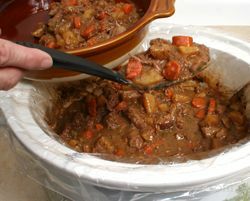 "We were snowed in yesterday so I made this slow cooker stew for our supper. It was delicious. 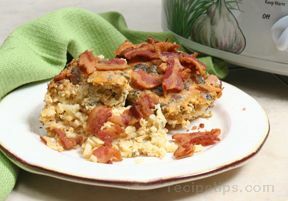 The perfect comfort food for a cold winter day." "I made this chicken noodle soup and ended up adding more broth to make it more soupy. Also, next time I will cook the noodles before adding them because it took them a long time for them to cook and they were a little mushy. The soup had great flavor." "Made it w/4 c. water and 1 16 oz can broth, and still too dense. 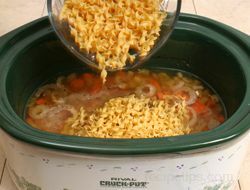 Add large can broth next time, reduce noodles to 8 oz., and cook outside crock pot."